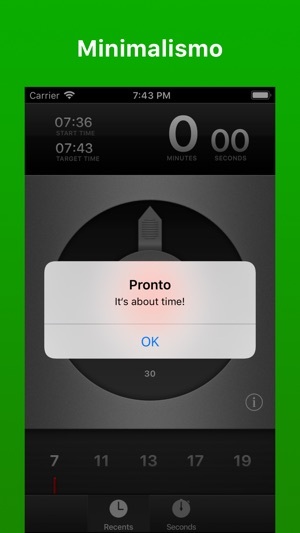 Pronto is a minute-based timer app. It fits in perfectly as your any-time reminder. Just turn the knob to set a time. Push start to begin the countdown. It’s that easy. Two problems with the simple timer. First, I can't make a 30 second timer or any timer below a minute. Even if I set the seconds first, say at 55 seconds, I can't then change the minute setting to zero. If it were possible to do this, then the other problem would be: the change of seconds is too close to Recent. Trying to slide the seconds bar gets too often interrupted by accidentally sliding over Recents, and then you have to try it again. The wheel would be easier, especially with the limitation that seconds are in 5 second increments. One final thing: the sounds offered are fairly obnoxious. Nothing simple and pleasant in case you want a sound that doesn't attract a lot of attention. I don't mind the sounds offered but I'd like the options of simple sounds. Most of them are musical and one in particular takes a second or more to even begin. 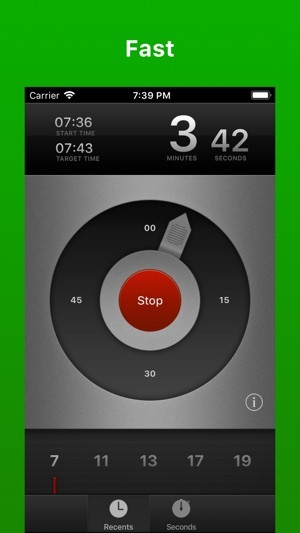 For a timer app that has essentially one function it fails at several things. Now you can use sub-minute countdowns. 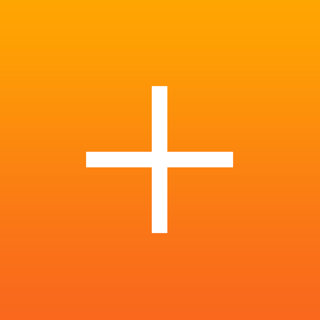 I love this timing app and use it daily to take a power nap's and do short timings on work projects. It is simple to use, intuitive, and does exactly what I need it to do. I even like the sounds that are used at the end of the timer. The user interface is fantastic. 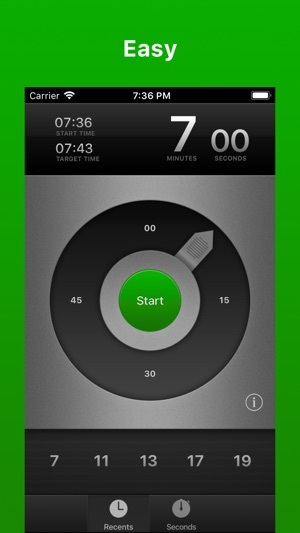 If you are looking for a stopwatch that has seconds, this app is not for you. There's plenty of other apps that do that well. This is more of a general timer to help you keep track of projects you're working on, cooking times in the kitchen, or power naps (like I use it for). I'm so glad that the developer updated this App so that it will work on iOS 11. I was worried that I wouldn't be able to use it any longer with the new software update. But it works! It's awesome! Don't hesitate to get this app. Get it, use it, love it! This is a pretty good and simple basic timer. I used it for lunches, breaks, timing medicine, etc. When the developer didn’t get a 64-bit app out in time for the iOS 11 lockout of 32-bit apps, I had to scramble and buy another one (which I actually like a lot more than Pronto now). However, Pronto does have a good interface for one time, one simple push button. Developer: please check your app on an iPad, it has no icon set (the 32-bit version did). Thank you for the feedback. The icon on the iPad will be fixed with the next release.